It's time to Sparkle....well it's Sparkles Christmas Challenge and this month Jane picked a fun theme. A Krafty Christmas. Your card must use kraft paper. I'm using the kraft card stock for my base and also for layers. 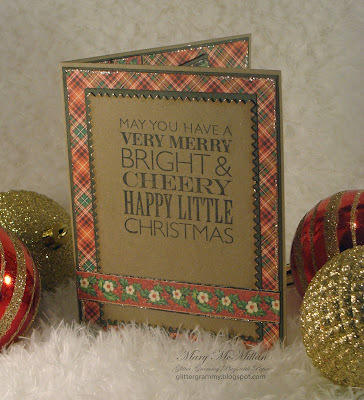 On the outside I ran the kraft stock through a Christmas Cuttlebug embossing folder. I thought it needed a bit more dimension. 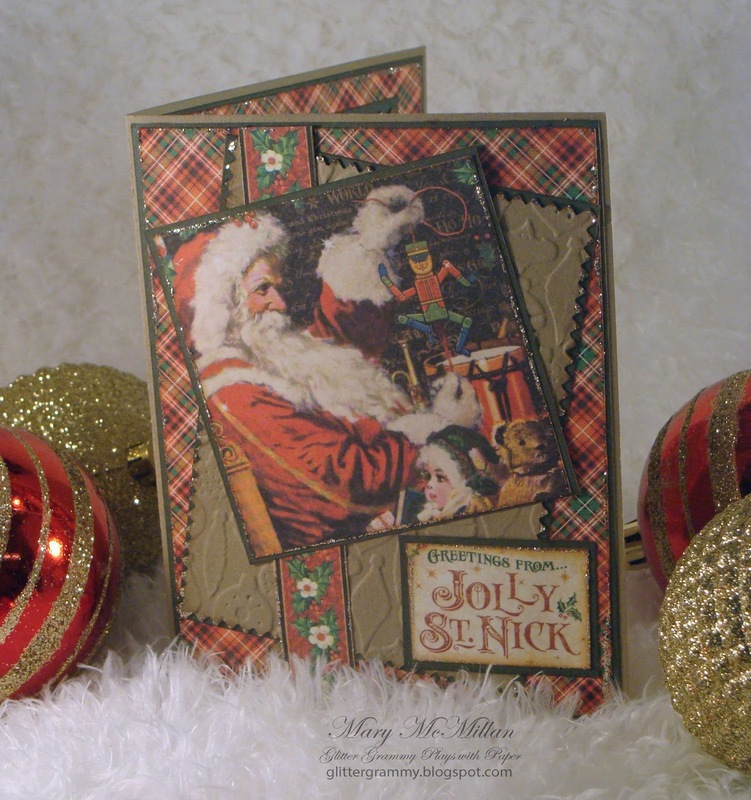 The decorative papers are all from the Graphic45 St. Nicholas collection. They all were pieces left over from making Christmas cards and decorations. I'm using pieces from the 8x8 and 12x12 paper pads. I've framed them with the solid green pieces and used Tim Holtz Distress inks to outline the papers. After doing a test layout, I thought it might be nice to add a bit of sparkle. I outlined the decorative papers using Stickles Mercury Glass. Well, that's the outside and now for the inside. It's pretty much a repeat of the outside. 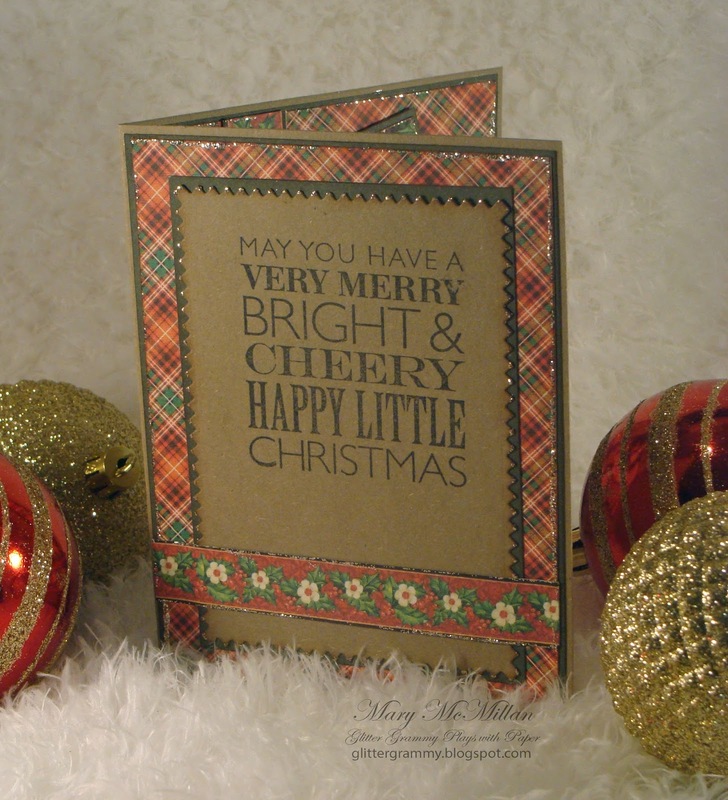 I did add a stamped Sentiment using my favorite Christmas sentiment. It's from Stampability. That's it. Pretty simple really and a great way to use up all those bits and pieces . You will probably see many of this type of card as I have many bits and pieces to use. Now it's your turn....Create a Christmas project using kraft somewhere on your creation and link it on the Sparkles Christmas Challenge. All the rules (and there are only a few) can be found on the Sparkles site. I'll be looking in to see what you've made! Mary, This is a gorgeous card with a lovely vintage feel! I don't do vintage well, so I'm a huge admirer of those that do. And, you absolutely own this aesthetic. Wonderful job!!! Completely stunning on the outside and the inside! Lovely cards with a vintage feel.